The Congestion Charge Zone is an area of central London. Motor vehicles driving within this zone between 7am and 6pm on weekdays must pay a congestion charge. The aim is to reduce traffic and pollution in the area. Funds go towards the public transport systems in London. The local government body Transport for London enforces the charge based on ANPR (automatic number plate recognition). It is your responsibility to pay if you will be driving in this zone during the hours of enforcement. Read this guide to find out how to pay the London Congestion Charge. The standard congestion charge is £11.50. This applies if you pay in advance or by midnight on the day of travel in the Congestion Charge Zone. You will have until midnight the following day to pay the fee, but it goes up to £14 on the next day. This will be the next charging day, meaning the following Monday if you travel on a Friday. You could save £1 if you register for Congestion Charge Auto Pay, as the charge will be £10.50 instead. It is a flat fee, so you will only have to pay once per day of travel, no matter how many times you drive in and out of the zone on that day. There is also an Emissions Surcharge for vehicles travelling in the Congestion Charge Zone. This is the T-Charge, which is a £10 daily fee on top of the regular congestion charge. You will have to pay this at the same time as the congestion charge if it applies to your vehicle. Most discounts and exemptions for the regular congestion charge will also apply to the T-Charge, but not all of them. Whether you have to pay the T-Charge depends on the emissions standard of the vehicle you will be driving in the Congestion Charge Zone. You can check if the charge applies here. Before you pay the full congestion charge you might want to check if you are eligible for a discount. You have to apply online and provide documents as supporting evidence. There is also a £10 annual registration fee for each discount type. Some can receive a 100% discount, such as Blue Badge holders, breakdown and roadside recovery vehicles, motor tricycles, and vehicles with 9 or more seats. Some discounts are only partial. However, there are congestion charge exemptions as well. Certain vehicles can travel in the Congestion Charge Zone without paying. 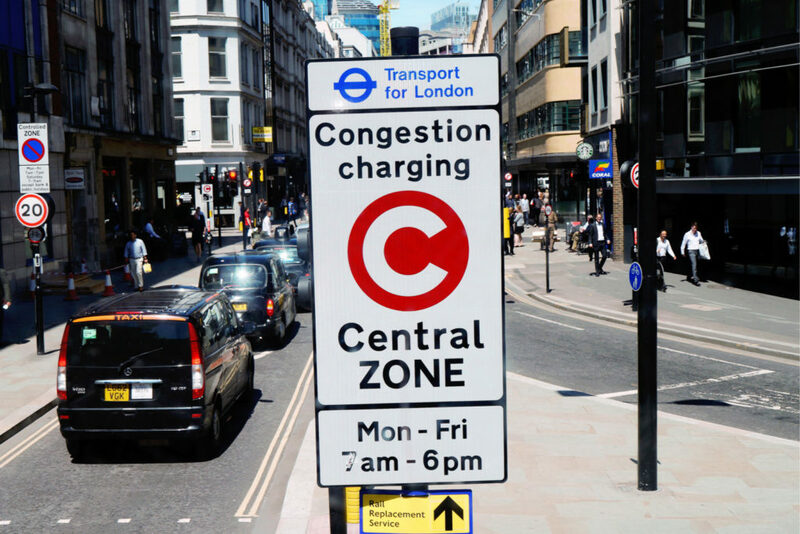 If the congestion charge (and T-Charge) applies to your vehicle, then you must pay the fee for travelling in the zone within the timescale. If you fail to do this, then you are breaking the law. Transport for London will send you a PCN (Penalty Charge Notice) for not paying the congestion charge. This is a fine which you will have 28 days to pay. The full penalty charge is £160, but you will only have to pay £80 if you pay within 14 days. Failure to pay after 28 days will result in a Penalty Charge Certificate, which increases the penalty to £240. You will have 14 days to pay this, or it will escalate to debt recovery and enforcement agencies. You can pay a PCN or challenge a PCN on the website. One of the fastest ways to find out about the congestion charge or pay the fee is to call Transport for London. The congestion charge enquiries helpline is open from 8am to 8pm, Monday to Friday. You can call 0843 208 2367 for help with the London Congestion Charge. First of all, it will ask you if you are calling for information on the Ultra Low Emission Zone. You can just say no. It will then ask if you are calling to pay to drive in London. You can say yes, or wait for the numbered options. Press 1 for yes or 2 for no. If you don’t proceed, it will ask you to enter your account number if you are a registered customer, or press the # key if you aren’t. There will then be a few further options. You can press 1 for discounts, 2 for refunds, 3 for penalty charges, or 4 for anything else. If you want to pay the congestion charge over the phone, you must provide the vehicle registration number and your card details. If you want to pay in advance or are not able to pay until the following day, then it is easy to do so online. You can pay for the congestion charge up to 90 days in advance of the day of travel, or on the day itself. As long as you pay by midnight the day after driving in the zone, you will not have to pay a penalty. The earlier you pay, the cheaper it is. Simply enter your vehicle registration to find your vehicle. As it says on the website, be careful not to confuse similar-looking letters and numbers. It is your responsibility to enter the information accurately, and if you don’t then you could get a penalty charge. Make sure that you submit valid payment details and that it goes through. 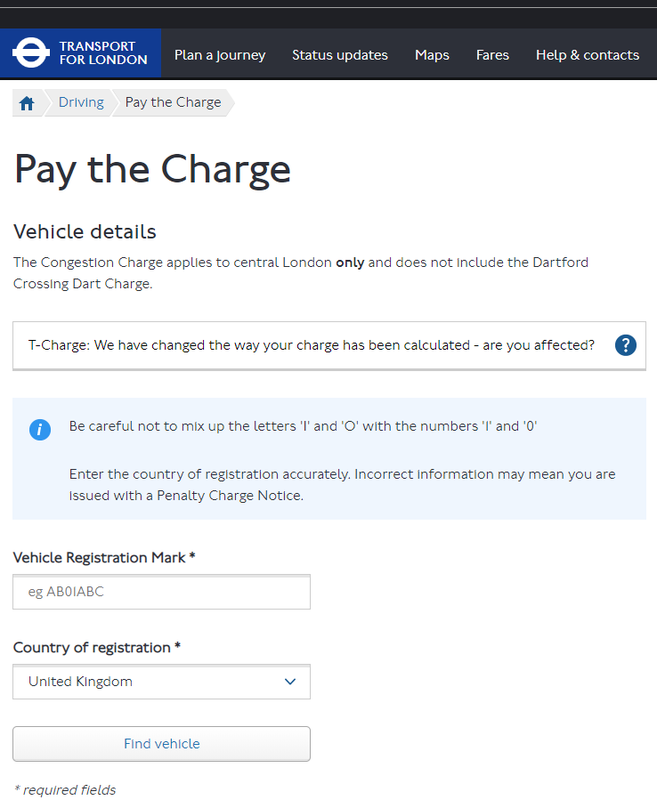 If you travel in the Congestion Charge Zone on a fairly regular basis and are not exempt from the charge, then you could save yourself some time and money with CC Auto Pay. Registering for Auto Pay means that you won’t have to worry about forgetting to pay. TfL automatically records the number of days that you travel in the zone during charging hours and calculates a monthly bill. The daily charge is also reduced to £10.50 when you pay this way. You can register up to five vehicles on your account. There is an annual registration fee of £10 for using Auto Pay, which is added to the first bill. Residents with the 90% discount can also register for Auto Pay with the congestion charge of £1.05 daily. There is a Fleet Auto Pay option for businesses with 6 or more vehicles travelling in the zone. To make paying the congestion charge easier, you can register online for a London Road User Charging Account. This enables you to store your details to make faster payments every time you need to pay the charge. You can save and update your vehicle, payment, and contact details in your user account at any time for more convenience. You can create a personal or business account. Personal account users can register up to 5 vehicles and allow up to 5 people access to the account, with individual login details. Create an account if you want to set up Auto Pay. 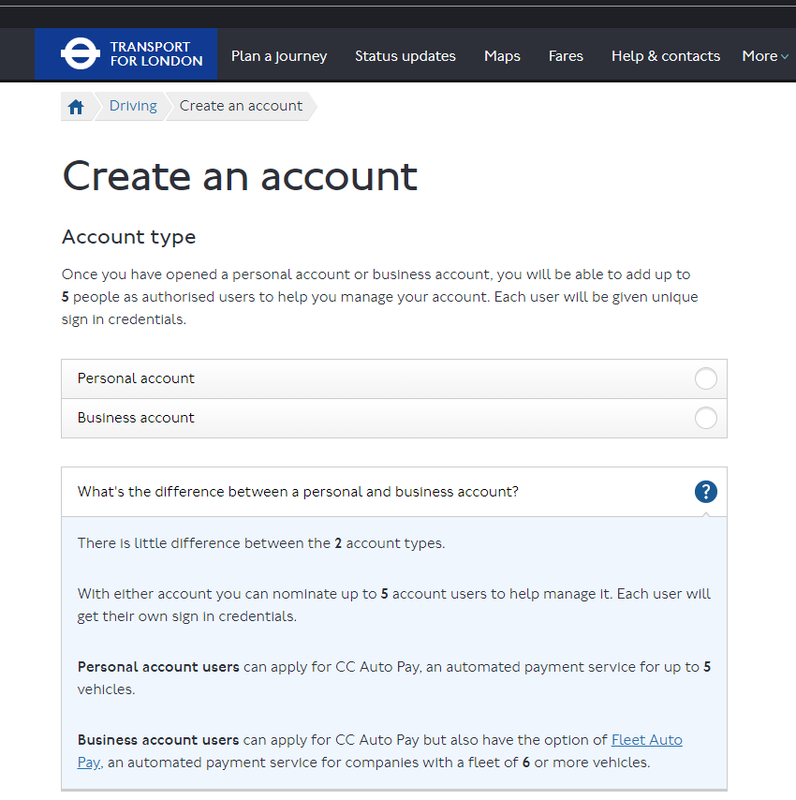 When you have a registered account, you can access it even more conveniently by downloading the official TfL app. It is available from the App Store on iOS and Google Play Store on Android devices. The free app will enable you to manage your account, save and change your details, and make payments for the Congestion Charge or a Penalty Charge Notice. If you already have Auto Pay set up then you can view your outstanding balance. You can also view your payment history in the app and use it to check whether a postcode is in the Congestion Charge Zone or not.